Digital wallets are becoming a worldwide trend, and one of the most convenient methods to pay for freelance contract work. A digital wallet is a piece of software engineered to assist in the transfer of money from one account to another, without the need for high risk credit card processing. Today, wallets can be used to pay for goods and services anywhere. As smartphone adoption rates rise, expect the digital wallet phenomenon to grow alongside it. The big story right now is the adoption of micro-chips on credit cards. These so called “chip cards” utilize high-tech security measures to prevent thieves from stealing your data. They also take up to a minute to complete your transaction. Even though they are getting faster, the system slow down hurts both businesses and consumers. 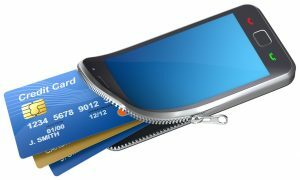 Digital wallets use Near Field Communication (NFC), which is a wireless protocol used to transfer data quickly. New phones also have fingerprint scanners. No more PIN to enter, just scan your finger print and approve the transaction. In addition, new wallets allow you to program your credit or debit card info into it. When you own a digital wallet or a merchant account provider like Charge.com for example, you can tie that account to your other bank accounts. This gives you more options to pay at a register, without having to dig through your checkbook. You may designate your primary account, but it’s never too difficult to access any of the other accounts you might have at your disposal. Digital wallets are the next big thing to come to financial technology, and it’s only a matter of time before they are used as frequently as cash or debit cards. With improved security, encryption and smartphone technology, the digital wallet can accomplish a lot in just a short time.